This luxury loft style unit with 19 foot ceilings is located at garden level facing the pool and courtyard. The unit has a poolside patio off the entryway. The sunken living room which features two story arched windows is level with the courtyard pool and tropical gardens and provides for spacious entertaining or relaxation. The u-shaped sofa is wide enough to double as extra sleeping accommodation. A half bathroom is located off the kitchen/dining rooms. The bright kitchen has hardwood cabinetry and is fully equipped with top of the line appliances. There is a large pantry and a dining table with room for four. This unit is fully air-conditioned and also has ceiling fans, in-suite washer/dryer, cable TV set up and a high speed Internet data port. A distinguishing feature of this condominium is a spiral staircase, hardwood with wrought-iron railing, ascending to the spacious upstairs mezzanine bedroom. The bedroom has beautiful hardwood floors with a king-size bed, a full bathroom with combined Jacuzzi bathtub/shower and a private terrace overlooking 26th Street. The Royal Palms is located in one of Playa del Carmen's most desirable neighborhoods. 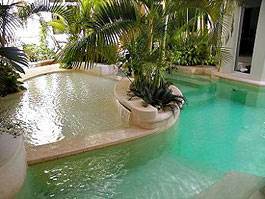 All Luxury condos featuring courtyard fountains and pool surrounded by tropical gardens. The Royal Palms Condos is located on famous 5th Avenue at 26th Street, within walking distance to Playa's fabulous restaurants and pedestrian promenade hosting galleries, entertainment and handicraft shops to upscale international boutiques. The cobble stoned streets are quiet in this safe neighborhood, only two blocks from Playa Tucan, one of the finest beaches in Playa del Carmen. Playa Tucan offers windsurfing, hobby cat sailing, snorkeling, fishing tours and dive shops. Royal Palms Condos' membership with Playa Tucan offers discounted rates on beach club facilities.